Working with teams can be very exciting, but it’s also very challenging. To be able to work with people and to lead teams requires to handle some tools and strategies to make it effective. Team building activities in Barcelona can be a great idea to engaged your team with your company’s goals. Let´s start by defining what is a team building and why this is such an important activity to include in your company´s yearly strategy. A team building is a process to turn a group of individual employees into a cohesive team, who are organized to work together to accomplish the company´s goals. It involves structured activities and exercises to develop some capabilities on workers. It´s always better to hire an expert or group of experts to guide and lead the activities, better if external to company so there is no conflict of interests. With this external help, groups can participate in structured activities specially designed to help them become an effective team, because they are customized to their needs. The resulting bonds of these types of activities will enable workers to accomplish the goals of your company in a more effective way, than with a non- bonded group. Another important feature of team building is that they develop better, to its full potential, when you organize them outside the office. So, traveling abroad can be a very good idea if your budget allows it. these corporate team engagement activities are a great way to get to connect with your group and learn how to work together, so it will create a major bond with your employees, reducing their stress levels and leaving a positive effect on the working atmosphere at the office. Have you ever thought about planning a team building in Spain? If you are thinking about Europe, Barcelona, in Spain, is a city full of charm, but it is also amazing for work teams. Here you will find a wide variety of day activities to do with your employees. The city´s famous architecture, its natural landscape, its fantastic cuisine and the wide range of possible activities are the main reasons why you should list this at the top of your options. There are some main values that base the experience of these types of activities, some as: empathy, trust, collaboration, culture and construction, so every program you develop should be in line with this to be successful. This should be an unforgettable experience for your employees! The sessions can include ice beak activities, games, roll play, cooperative assignments, group brainstorming, discussion topics, among other; but, all of them have to be integrated with your daily work. When you are planning a team building in Barcelona you must cover all the details and logistic of traveling and accommodations for your colleagues. Barcelona has a complete and very good infrastructure for events, so that won´t be an issue. 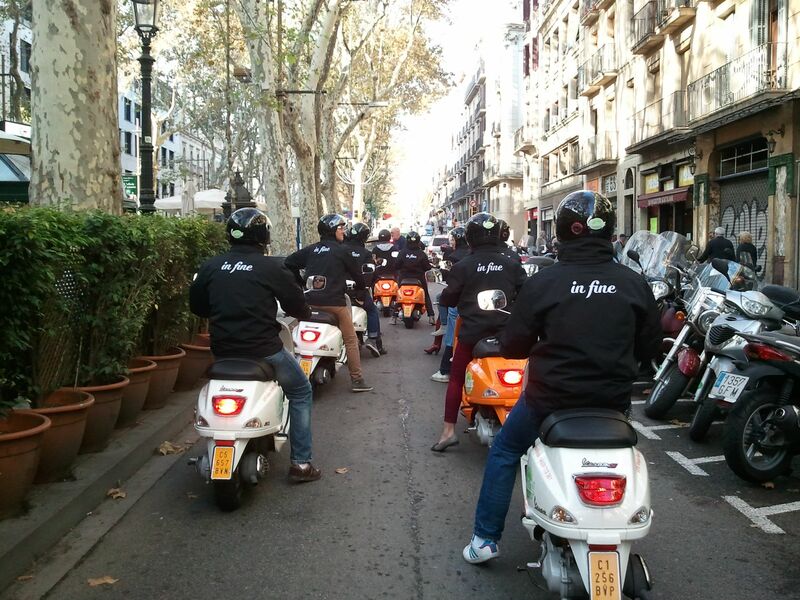 There are some team building activities in Barcelona for groups (small and big groups) that you can seek or –as described before- have a full specialized plan. Each case has its objectives and goals to reach according to your company´s needs. 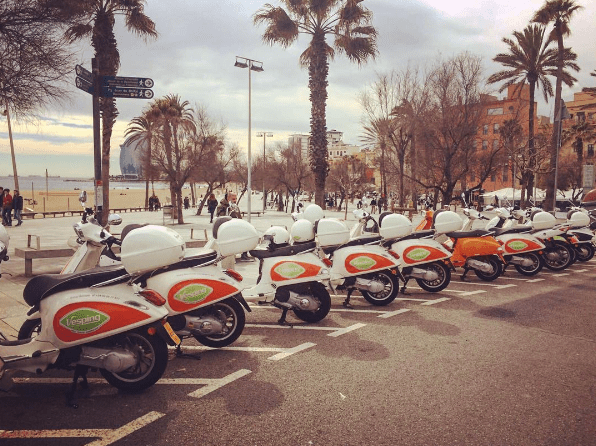 At Vesping, we are team building specialists and by renting a group of vespas you will provide your employees with an incredible tool to strengthen collaboration and friendship with this fun activity. Of course our staff will accompany you at every stage of the event. From its planning until the end you will be completely advised and securely followed to get the most from the event! If you are looking for some others team building activities ideas in Barcelona, see the coming list of available options to make your own schedule and make the most of the event and of your team! The first thing you should be thinking about when planning a team building in Barcelona is to make a list of possible corporate team building activity ideas so people don´t waste any valuable time during the event. When planning a Vesping Team Buiding and Corporate Event you can choose and integrate any of the following ideas. Iberic Ham (Pata Negra) Taste Experience: just few steps from our store you can taste the ham in the world with our partner Enrique Tomas Sagrada Familia in Carrer de la Marina 261. Spanish cooking experience: almost nothing brings people together as cooking! Book this activity and see all groups collaborating to have a delicious result when they need to prepare the Spain´s iconic dish: a paella. This is an excellent choice as a corporate team engagement activity. If you want to know a little bit more about team building outdoor activities for employees you should keep in mind the time of the year you are planning the event so you can make the most of the weather conditions. Regatta Sailing: this physically hard work and technically demanding activity requires high levels of concentration and collaboration, so you will see how they develop during a competition. This would be a great option for an outdoor team building activities. Treasure hunt: this fun activity requires attention, concentration and collaboration from all group members to achieve the goal. They will have to work together to solve the problem, as in real life. Escape rooms: this is a trend in the city, so includes mentally demanding games that challenge participants to find the clues to solve a given problem; so, communication and team work are a must for colleagues to succeed. As you may have seen, team building activities in Barcelona are all about mixing fun with some valuable learnings that you wouldn’t be able to offer in the walls of your company. Team building events in Barcelona are based on inspiring teamwork and collaboration, then, the challenge is to take those learnings and include them into the business plan of your company, because this method shows immediate results on people and by the hand of Vesping we are sure you will provide your people the right experience! That way these types of events are very helpful to define lines of communications to solve problems as a team, respond quickly to change, develop new ideas, encourage learning and embrace creativity even if it is a weekend team building, you just have to make the most of the available time you have. You can even add some holiday activities if your plan is to do this on any holiday season, so people will get very excited about it! So, we invite you to be open to try some new experiences, think about improving your team soft capabilities and have fun in the process! We will wait for you! Ask your free quotation here!